Catherine Brumbach (“Katie”) was born with everything she needed to succeed in life, and she grew to be a beautiful, strong woman, a really strong woman. Her physical strength and beauty gave her an edge in a man’s world, making her the specimen of perfection. Brumbach was the second oldest of 15 children whose parents were circus performers. Of Bavarian stock, Philippe, who was six feet six inches tall and weighed about 260 pounds with a 56 inch chest, and his wife, Johanna, whose biceps measured 15 inches, amazed European audiences with their feats of strength. Three daughters inherited the strength and talent of their parents and joined the act very young. When she was two, Brumbach reportedly did hand stands on her father’s hands. She was trained in gymnastics and then added weightlifting to her regime when she hit adolescence. Brumbach wasn’t the strongest of her siblings, but her strength combined with her perfect proportions and natural beauty made her the main attraction. The Brumbach family were contract players in circuses all over Europe, and Brumbach’s star continued to rise. When she was a teenager, her father offered 100 German marks to any man who would come on stage and beat her at wrestling. She won every time, and one evening she got a prize she hadn’t expected. Max Heymann, a five foot six inch acrobat who weighed about 160 pounds, was having a hard time getting his career off the ground. He saw an opportunity for easy cash and sauntered confidently onto the stage. Brumbach won the match handily, but he won her heart. She was 16 and Heymann was 19, and two years later he joined the act permanently when they married. While touring around Europe, the strongwoman and her fellow performers happened to briefly go to New York. As a publicity stunt at the end of the act, she challenged anyone who dared to try to lift more weight than she did. Eugen Sandow, the most famous bodybuilder of the time (click here for the profile of Eugen Sandow) happened to be in the audience. No publicity manager could have ever conceived of a more perfect attraction. They matched each other pound for pound until Brumbach lifted a 300 pound bar bell over her head. As a stunned audience witnessed, Sandow could only raise it to his chest. 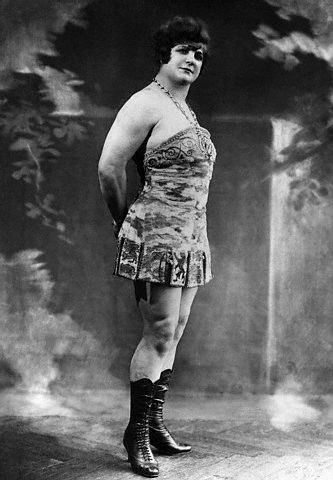 Brumbach proudly carried her victory with her everywhere by adopting the moniker “Sandwina,” a female derivative of Sandow. Sandwina and Heymann and a couple of other men became “The Sandwinas.” Early in the 20th century they came to America for a more extended commitment and performed with small vaudeville shows up and down the East coast. A year later they were hired by the prestigious Orpheum Vaudeville Circuit and toured throughout the country. Sandwina was billed as “Europe’s Queen of Strength and Beauty.” She twisted iron bars into spirals and broke chains with her bare hands, juggled cannonballs and supported a 1,200-pound cannon on her shoulders. She even lay on a bed of nails while volunteers used sledgehammers to hit an anvil balanced on her chest. In 1909 while on tour with the Orpheum, the Heymanns had a baby, Teddy. Being pregnant made Sandwina seem more feminine to some people, but she didn’t let it interfere with her career. She performed two shows the night before her son was born. This strapping child, who weighed 50 pounds at age two, was nicknamed “Superbaby” by the press. During interviews, reporters asked Sandwina’s advice on the care and feeding of children so other kids could grow up to be equally robust and strong. The Sandwinas went back to Europe for a while. Holding her husband overhead had become a popular feat, and to add to that, for the finale Sandwina lifted three men. John Ringling, one of the brothers who had recently bought the Barnum & Bailey circus, was on a scouting trip. He signed Sandwina and Heymann and brought them back to the States in 1911. They weren’t a featured act but instead had to perform simultaneously with four other strength acts, all competing for attention. When reporters became curious about Sandwina, a press conference was arranged to move her into the spotlight. P.T. Barnum was once quoted as saying, “Without promotion something terrible happens…Nothing!”1 so meeting the press became an event. At Madison Square Garden, where they were performing, over a dozen doctors were brought in to weigh and measure Sandwina publicly. She was deemed to be the perfect female specimen. She was five feet nine and three quarters inches tall and weighed 210 pounds. Her chest was 44 inches, her waist was 29 inches, and her hips were 43 inches. Her calf measured 16 inches and her flexed right bicep was 14 inches. To enhance her appearance, especially in contrast to her husband, Sandwina always wore two-inch heels and piled her hair on top of her head to make her look taller. When the measuring was finished Sandwina demonstrated her strength for the reporters. First she lifted Heymann over her head with one hand, and then she lifted her husband and son, holding them both with only one arm. For all her bulk, Sandwina was described as beautiful and feminine with supple curves and arms smooth enough to look good in a ball gown. With her new status in the center ring, Sandwina was earning up to $1,500 a week. Sandwina represented the perfect woman in many ways. Besides her physical beauty, strength and charm, she was a working mother. In 1912 she became the Vice President of the suffrage group at the Barnum & Bailey Circus. Working with her husband and dominating him in the act made her seem all the more liberated. In 1918 while the Heymann family was in Istanbul, a second son, Alfred, was born. The story has been passed down that it happened during some civil unrest and Sandwina had to crawl under barbed wire to get herself to a hospital. When she arrived, the hospital was full and she gave birth on the floor. When The Sandwinas retired from the Barnum & Bailey Circus they continued to do what they loved. For a while in the 1930s they worked with the WPA circus, and then in the 1940s they opened a cafe/bar in Queens, New York. Occasionally when a customer asked, Sandwina would bend an iron bar or break a horseshoe after serving their drink. In 1952 Sandwina died of cancer, and after 52 years of marriage, The Sandwinas split up.